7 Stories is a podcast for your ride to school. These highly produced 7 minute stories are sure to keep your kids engaged while in the car! 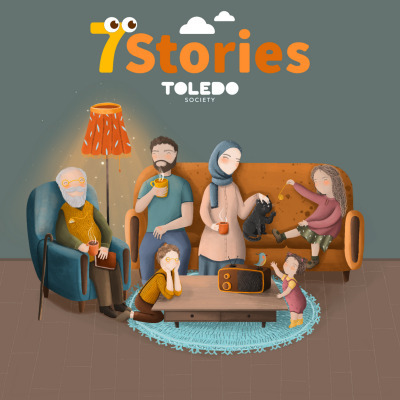 A Toledo original and the first of its kind for Muslim parents and children, this show is hosted by Wasan and Moeed. In Season 1, we'll have funny stories…and sad stories…and scarrrrry stories….but each story has an important message for you to discuss with your children! We’ll hear stories such as Spidey the big red spider, and about the chicken that was an eagle! Wasan Altikriti is a mother of two young girls and is the founder of Arabic learning-resources start-up called 'Arnoub'. Wasan is a public speaker with a PR and Media background. Moeed Ahmad is a digital media executive who has spearheaded the launch of multiple successful brands like AJ+, Jetty and Contrast VR within Al Jazeera where he currently heads Innovation and Research. He is passionate about open source technologies and other community enabling movements such as the Creative Commons. Most importantly though, Moeed is a father of three boys with plenty of experience dropping his kids to school!